Those who know me are aware of the fact that I'm no big fan of mini/micro speakers. So, when Openitem contacted me, I tried to ask them to let me test a medium-sized bookshelf model at least, avoiding the micro ones. However, maybe because of a misunderstanding or, perhaps because they were so confident of the quality of their product, they sent me a pair of Cocaine S-40, a very small 2-way bookshelf speaker with a mid-woofer of just about 4.3 inches. (actual size: 3.7 inch.). I accepted the challenge. 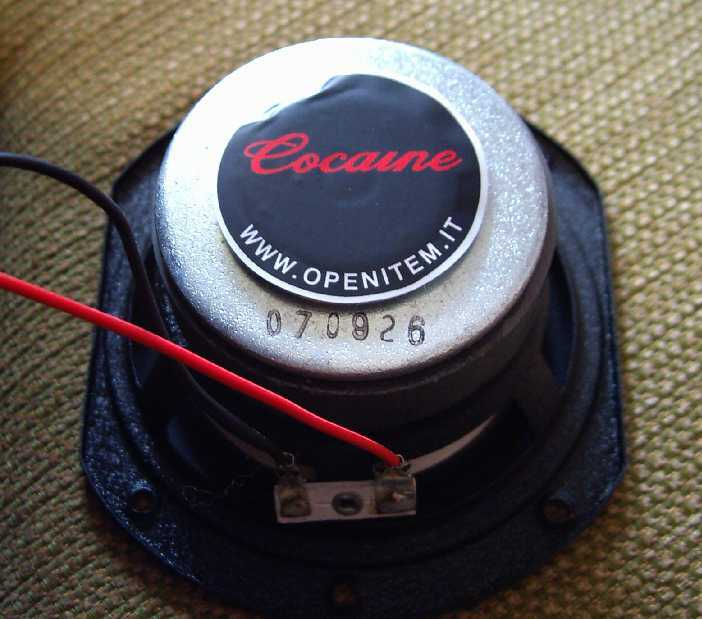 Actually, Cocaine speakers are made in China, under clearly-stated "Italian specifications". I asked for further details on this statement, but my curiosity has been only partially satisfied: "Italian design" and "Chinese manufacture" was the answer. Mr. Antonio Scialò, the man behind Openitem/Cocaine, proved to be well mannered and helpful, providing all the technical information he had (not so much, actually). Let me conclude this brief introduction with a critique on the name that has been chosen for these speakers'. Cocaine is somewhat weird, and, although it refers to a quite famous song (which, in fact, can be listened to in the background when surfing the website of the Company), the song actually refers to the even more popular drug. I'm a bit confused. Frankly, I consider this an unpleasant combination. Unfortunately, in English, this name can recall an awful lot of irresistible jokes. A retailer of this brand could be called "cocaine dealer...or pusher!". Not to mention the perspective fan of this brand who could be called "cocaine addicted" straight away. Let's say that might be embarrassing to say the least. 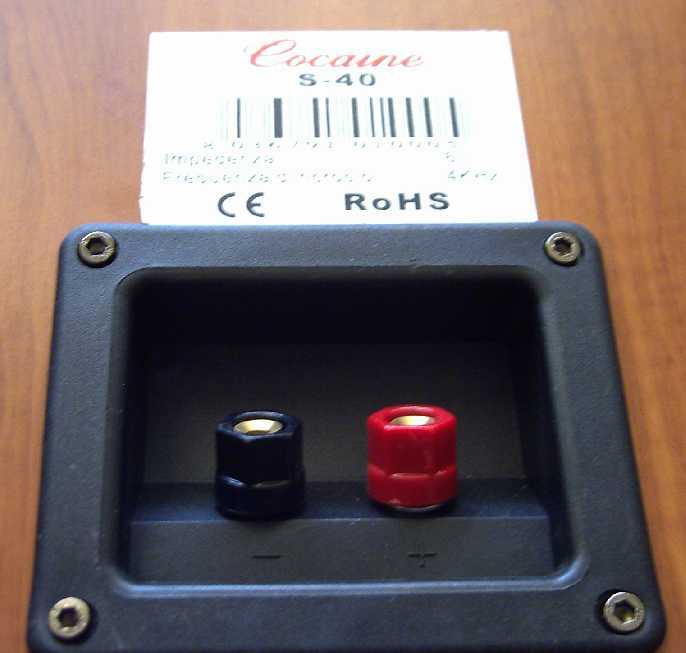 The Cocaine S-40 are small (13 x 7.2 x 8.4 inches) two-way speakers in a ported box, with a mid-woofer just four inches in diameter (actually, the real size of the cone is smaller than that). The tweeter size is about 1 inch, with a transparent membrane, whereas the woofer is made by yellow coloured Kevlar® with a long-throw, and equipped with an aluminium dust cover. 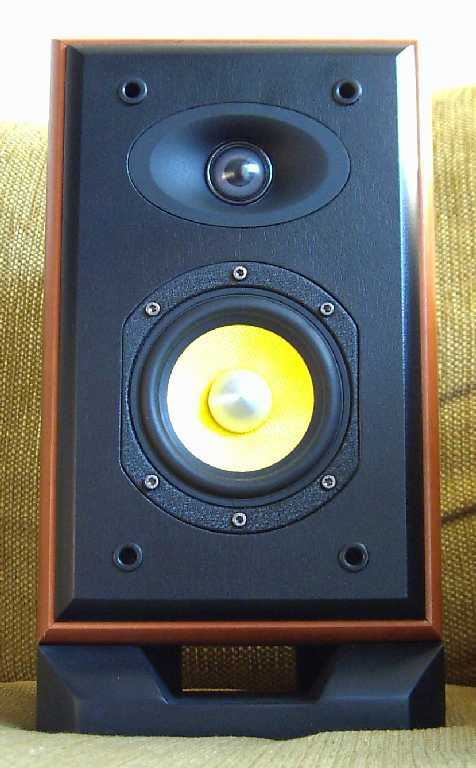 The air coming out of the reflex port flows towards the foot of the speaker, as seen in speakers of the same size (i.e. Indiana Line Arbour 5.30). This way one should be able to minimize the interactions between the reflex port flow and surrounding walls, as the air coming out of the pipe always "sees" the same type of acoustic load. As a consequence, a speaker with such a load could, in principle, be set against the back wall of a shelf. However, as I wrote many times, this is not a problem: any reflex port needs about 5 inches of 'freedom' to work well, the presence of a wall in the nearby back-side is ALWAYS a problem, instead. In fact that would lead to an increase in the low and mid-low range frequencies and to a sound coloration in the midrange. 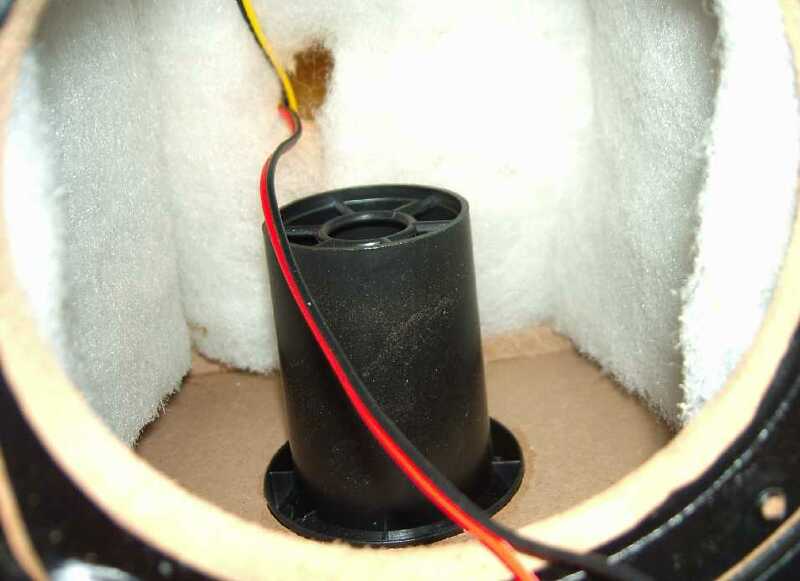 The mid-woofer is mounted on the front with 6 Allen key screws and the flange of the tweeter appears to be framed in, without visible screws. In the back, the speaker plate provides a simple 'monowiring' with plastic made binding posts that can accept banana plugs, bare wire and forks. 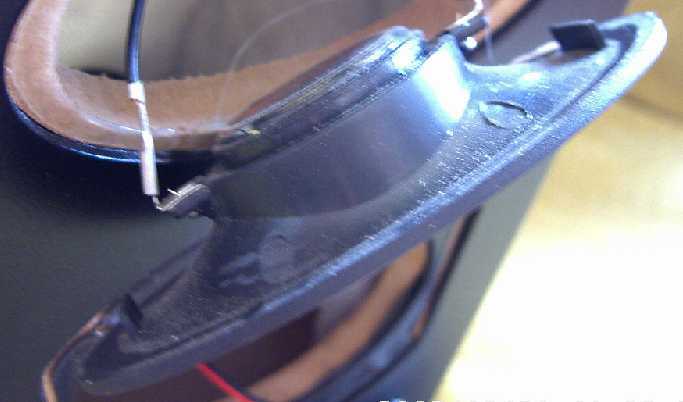 The usual binding posts protective caps that would be required for the CE certification (displayed along with RoHS certification) on a sticker attached on the back of each speaker, are actually not supplied. The cabinet is well made and finished, the look does not easily suggest the cost of these speakers. 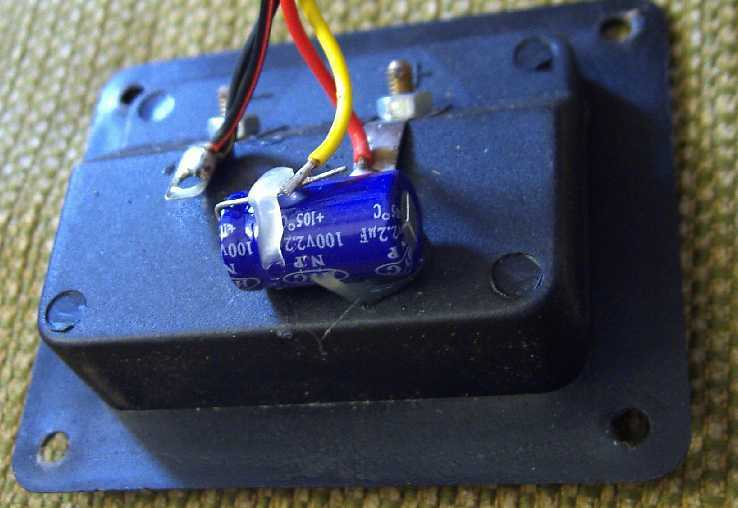 The material used seems to be MDF, the crossover is minimalist, practically a simple 100V/2.2 uF capacitor on the tweeter. The wiring also looks minimalist. The monowiring binding posts and the sticker with make, model, CE and RoHS certifications. The port comes out of the bottom of the speaker. Also note the abundant stuffing. Let me comment on some technical specifications in particular on the frequency response, and on the sensitivity and maximum power allowed The first is rather optimistic given that in my listening environment, I measured a difference of about 5 dB between 60 Hz and 1 kHz. The 50 Hz were even lower than that. And, in the range between 50 and 60 Hz the resonance in the ported box is quite evident, which means that it has realistically been tuned in this range. One more observation concerns sensitivity, very optimistically stated as being 86 dB/W/m. Mr. Scialò - quite surprisingly - told me that he believes the sensitivity to be closer to 83dB than to 86dB. In my opinion it is even lower than that, given that a direct comparison with the Norh 4.0 (84 dB/w/m) has always given a measurable difference of about 2 dB. Therefore, sensitivity should be definitely closer to 82 dB, maybe even a little less taking into account that the stated 6 ohms impedance should require a little more power amplifier (thus helping the speakers). A difference of 5 dB between declared and actual data seems excessive to me. Besides, it is quite strange that the manufacturer himself declared that the sensitivity should actually be below 86 dB. Since he designed the loudspeaker, and even its drivers (at least, so Mr. Scialò said), he should know the sensitivity level precisely. Right? Knowing the sensitivity datum is also essential to try to match the speakers with the right amp. Not incidentally, Openitem/Cocaine recommend an amplifier with more than 50 watts per channel. What really surprised me was the stated spec for maximum allowed power, optimistically declared at 350 watts!!! Perhaps that is the power needed to shoot against yourself the poor midwoofer like a bullet! Considering the tests I've done (as the laws of physics would suggest) it is better to take care of the position of the volume knob, as the maximum limit of the mid-woofer can be reached very easily and quickly (more details below). These speakers had been evaluated over a relatively long period of time compared to other small speakers that I use as references, such as the Norh 4.0 (old series) and the new 2-way micro Scythe Kro speakers. Given their low level of sensitivity, I didn't dare matching these speakers with some small low powered amplifier such as the Trends TA 10.1, the NuForce Icon and similar systems. During the tests I wanted to be sure to have all the necessary power, so I hooked them to a pair of NuForce REF9 SE V2 power amps (180 watts per channel). Although I'm not a fan of mini speakers I have to say that these S-40 impressed me nevertheless: the tonal balance is excellent, with extended and precise highs (sometimes even too much) and unexpected bass for the size of the mid-woofer and the cabinet. There is more than a bit of a loudness effect (extreme frequency range emphasis) but given the class of product, this is absolutely reasonable and perhaps it even brings some benefit. The bass seems to be a little swollen around 100 Hz but it goes down enough, let's say that the 50 Hz are not too hidden, although 'contaminated' by the resonance of the reflex box. Just to be clear, their low range is substantially better than the one provided by the stingy Norh 4.0, although these adopt a larger woofer: the bass is more extended, more powerful and articulate, perhaps just a little bit slower. The snare drum, for instance, is not as violent as with the Norh 4.0 and some voices appear to be slimmer than they should. The mid-high frequency range is extended and very accurate, perhaps a little bit "ahead", as proved by the emphasis of the master tape noise in some recordings. This is more evident (and annoying) with the S-40 rather than with the Norh 4.0 and some other loudspeakers. The harmonic richness in mid-high frequency range could be bettered and, for instance, some piano notes appear slightly more essential than they should be. The fact that the mid-woofer is not filtered, almost certainly this causes an overlap with the working area of the tweeter. This probably does not help the correct reproduction of the harmonics in the overlapping frequencies area. The sound, however, is always quite accurate, detailed and analytical but never tiring, thanks to the unexpected performance of the bass frequencies. Maybe these speakers are not as polite and correct as the Norh, but they are certainly more solid and generous. The Thai 'drums' have different strengths by their side, as we will discuss in the next two paragraphs. In this department some weakness of this design become evident, no wonder why as this type of project is quite extreme: a small mid-woofer strongly exploited up to the limit of its physical possibilities! All is well until it reaches its physical limits, indeed. Unfortunately, those limits are not that far, that's why I say that 350 watts of maximum power are somehow so optimistic to be considered almost comical and surreal. The speakers sound reasonably fast and loud, but you need to be careful with the type of music you listen to. If you usually listen to music with a lot of rhythmic and powerful bass, the limit of the mid-woofer can be reached quickly. Just to be clear on this, with "ordinary" music programs I managed to get sound pressures around 97/98 dB peak at the listening seat (which is a lot of SPL anyway!). When the bass becomes more 'aggressive' the speaker cries for lowering the volume up to sound pressures of about 93 dB (as measured in my listening room). Once the midwoofer reaches its maximum "travel" you can't go louder than that. And this is quite disappointing. Very likely many audiophiles do not listen at so high SPLs or feed these small creatures with such killer records as I did. Nonetheless, it's better to be aware of the dynamic and power handling limits of these loudspeakers. From this point of view, the Norh's are quite a different animal: even at higher volumes, with the same recordings, they never suffered that much. The 'guilty' songs, just to name a few, range from 'Sweetheart' by Mariah Carey to 'Take the Power Back' by Rage against the machine up to 'Teardrop' and 'Angel' by Massive Attack. So we're talking about absolutely excellent records, 'normal' recordings, not of audiophile grade. So: be careful not to overdo the tiny speakers, they do not deserve it. To use this information in the right way you should, however, be able to measure the sound pressures we are referring to. This is non to easy to achieve without using a sound level meter. Summarizing, I can tell you that the dynamic performance is good until the small woofer reaches its physical limits, as it is forced to reproduce the entire audio spectrum (the driver is not filtered). Apart from that, it works wonders. With a different ported box tuning, maybe with a "safer" crossover, they might have managed to improve their power handling but, probably, the bass would have not been as extended and powerful. As usual, life is full of compromises. Finally, it should be noted that these speakers can sound very loud - without losing their verve - with dynamically compressed music such as many modern recordings. For example, with Finley's hard-pop (something similar to Green Day), the sound pressure can be high most of the time because the dynamic is very compressed. So, let's not confuse things: 'quiet' but very dynamic music will put these speakers on the borderline, whereas music apparently more aggressive (but dynamically compressed) will be reproduced with fewer problems. I hope that I have made this clear. My reference in this area, the Norh 4.0's, thanks to their ability to 'disappear', helped by the special cabinet and 'isolated' tweeter are a tough rival for bookshelf speakers of standard type. Therefore, even on this side, the S-40 must give way. The image that the small Cocaine can create is nonetheless well built, with a very good height, but less width and depth. Indeed, precisely on this latter aspect, I think that the S-40 have a tendency to bring the sound closer to the listener, much more than other small speakers which I listened to. This is surely not so relevant, because given the type of user being targeted, the prospective buyers will hardly have such an inescapable requirement. It would be a big achievement if these speakers would end up being positioned on stands of suitable height rather than on desks or shelves as it often happens. With such bad configurations the reproduction of a believable three-dimensional image can be hardly achieved. On the horizontal plane, however, the location of the instruments and singers looks good and so the focus. Do not expect a very wide stage, but what's available is sufficiently clear and detailed. As a matter of fact, I did not notice any particular difficulties in identifying the positions left / right / center of the individual actors of the virtual scene. Apart from the usual break-in, that seemed shorter than usual (perhaps the speaker had already been playing for a while before shipping?) I would recommend a good positioning, possibly away from the walls. The bass is fine as it is, strengthening it with the presence of nearby walls or corners could unbalance the overall sonic performance, and the S-40's certainly do not deserve it. These speakers are not that heavy, so if the stand is high (as it should be) but too light, the entire structure would be ready for take-off at the slightest knock. As I said, these speakers need to be paired with a quite powerful amp (forget the T-Amp & C., considering the very low sensitivity) but avoid exaggerating on the other side, as they would not tolerate high power. In my opinion you could start from a good 30 watts up to about 60-70 watts. Going beyond that may not be necessary and could prove dangerous to the health of the midwoofers. I would advise you to lower the volume at the very first sign of weakness of the speaker so to let the voice coil cooling for a while. The loudspeaker looks well built and finished. The wood is well imitated and even the black front baffle is very elegant. The speaker terminals are adequate to the class of the product and comfortable to use. A small nuisance, I'd like to tell the distributor/manufacturer about, as he could maybe get it fixed, is the tightness of the "bushes" hosting the pins of the dust grid and the speaker terminals. Bushings in the front can slip off (it happened while extracting one grid dust!) and, curiously enough, the hole appears to be in direct communication with the interior of the speaker! Were the pins not tight enough (and, they are not! ), the holes hosting the dust grid are likely to allow venting air outside. The purpose is twofold: on one hand this would prevent them falling-off and on the other you can seal the communication with the interior of the cabinet. Same goes for the speaker posts tray attached with four Allen screws that do not sit perfectly in the holes of the plate. Moreover, the binding posts plate has no seals at all. You can fix this with a little bit of wood glue or a small piece of thin foam rubber and get a perfect seal. 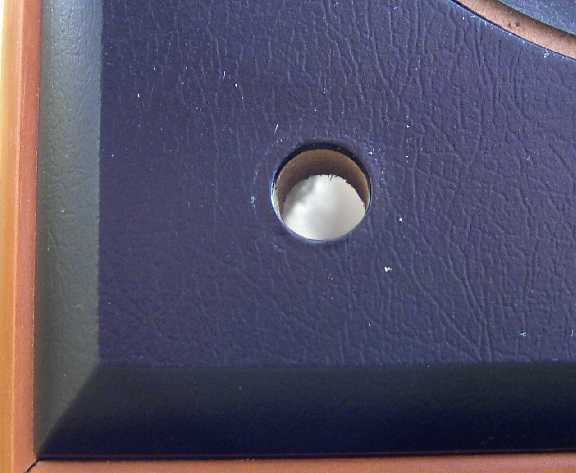 The tweeter has been attached without screws by using a bit of glue on the rim of the flange. The packaging is adequate but the documentation is really minimal: just a few lines on a sheet of paper that also serves as warranty (and thus should be sent back!). Written in a lame Italian, unfortunately with many several typographical errors (to say the least), with accents instead of apostrophes, spaces between commas and parentheses randomly inserted. Also, there's a statement that is technically wrong: amplifiers can't be used over 60% of their RMS power, otherwise they produce distortion! This, in practical terms, should mean that of a 100-watt RMS amplifier you can only use 60 watts before it starts to distort, which is obviously false. Note that the RMS power of an amplifier is defined as the one the amplifier can deliver at a given load without distorting (or at a rate of distortion within specifications). Therefore you should be able to use 100% of RMS power without causing problems to the speakers, if they can bear it. If anything, it should be recalled that many amplifiers generally provide their maximum power well before the position of 'maximum volume' of the knob. Going beyond that, would typically mean running it out of its optimum range, thus adding dangerous distortion to the signal. While reading the leaflet accompanying these speakers, I was under the impression that it has been written roughly, just because in some way a user manual had to be enclosed with the product. I would recommend the dealer to rewrite it in a more professional manner, both in terms of contents, syntax and punctuation. Even the automatic correction tool provided by Microsoft Word might help. These small details would increase the perceived value. Finally, I'd also like to point out that there are some commercially available speakers branded Hallyster and distributed by the Italian electronics store chain GBC, which are aesthetically identical to the Cocaine's and marketed at a fraction of the cost (down to 1/3 the cost of the Cocaine). Even the model numbers (S followed by a two-digit number) are identical! I was able to find only the S-50 and S-70. Not having been able to get my hands on a pair of Hallyster S-40 (I do not know if they even exist) I can't make direct comparisons or assumptions. Certainly I would exclude the fact that they are clones, as it is generally known that only famous and commercially appealing products are generally cloned. Cocaine, as a newcomer in the market, does not have such a visibility, hence it can't be attractive for cloners. There may be slight differences compared to the main production sold under another brand at a different price or, perhaps, these are the very same speakers with a different brand. In China this is not unusual, indeed. I asked Openitem about this, but they chose not to comment on that. I did not like their attitude as, in my opinion, considering the small market we're in, being sincere and "transparent" always pays-off. A long and unpleasant discussion among various audiophiles and the manufacturer, about the similarities between Cocaine and Hallyster, can be found on the T-Class Forum (discussion in Italian only). I have few complaints about sound performance. These are small speakers that sound much bigger than their size would suggest and that, of course, pay the price for some extreme design choices: the extension and the presence of the bass range, for example, have been obtained reducing the power handling, the speed and sensitivity. A speaker is always a compromise between different needs: in this case however, the power handling has been greatly sacrificed, to give the speaker the sound of a bigger loudspeaker. Such an overlapping large frequency response between the mid-woofer and the tweeter (I remind you that the first is not filtered and goes very often up in the frequency range) brings some problems of consistency and image, which indeed seems a bit too put forward. The range of use of these speakers is objectively limited: it takes a lot of power to make them sound but be careful not to exceed, in order to prevent distortion and clipping: their operating 'window' is actually quite narrow. These S-40's are, in some sense, quite extreme: a mid-woofer pulled by the neck gives them an amazing sound for impact and extension, provided that you do not raise the volume too much with strong bass music. In that case, the limits of the drivers can be easily reached. The very low sensitivity, then, forces the use of quite powerful amplifiers, as noted above. However, they cannot be fully exploited due to low power handling. Therefore, this product performs very well for what it costs but it requires some compromise that must be taken into consideration before purchasing it. On the other hand this is a problem common to many bookshelf speakers, even to the most famous and revered such as the LS3/5a: so many watts to make them play but you need to be careful when turning the volume knob. To many audiophiles this can be an acceptable compromise, to others, it is not.